Gaze upon snow-covered mountain peaks. Explore museums, galleries and restaurants. 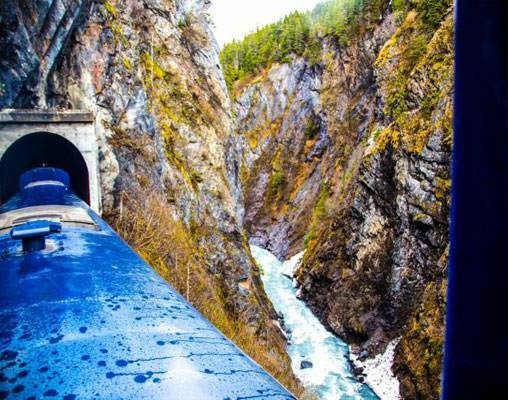 Ride through vast expanses of the Alaskan landscape by train. Set your sights upon incredible displays of nature. Gain a new-found love for the United States’ Last Frontier, Alaska. 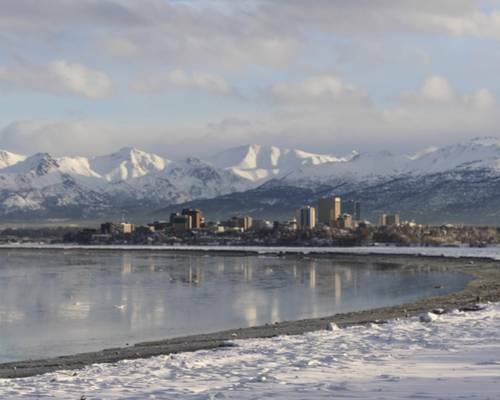 This amazing tour is filled with opportunity and sets off on a round-trip route from Anchorage, where your time will be spent exploring the amazing culture this town has to offer. Also in Anchorage, your Alaska Railroad train awaits to transfer you to your next big-city destination, Fairbanks. The sightseeing options are bountiful here, as well; however, your time here is brief, as you are off for a great, 2-day adventure in the Brooks Mountains to Coldfoot Camp. In Coldfoot, you will see luminous colors flood the sky as the Northern Lights come into view at night and you will have endless choices for tours and outdoor adventures before returning to Fairbanks and then Anchorage. With transfers by small plane, bus and train, this tour offers little-seen views of Alaska and a fresh take on this wild land. As your flight arrives in Anchorage today, transfer independently to your hotel. Once you get settled, you will have the remainder of the day to explore the city at your leisure. Some of the most popular attractions in the city include the Alaska Native Heritage Center and the Anchorage Museum, though there are also plenty of sales tax-free shops to explore. The vibrant dining scene in Anchorage is a well-kept secret that includes regional specialties and world-wide favorites. Overnight Anchorage. Make your way to the Anchorage train station this morning to board your Alaska Railroad train. Bound for Fairbanks, the Aurora Winter Train follows a 12-hour route that takes you through cities such as Wasilla, Talkeetna and Healy, as well as through long stretches of isolated backcountry that give you a view of Alaska that not many travelers get to experience. On clear days, you may even catch a glimpse of Mt. Denali as the train moves past Healy. Keep your camera ready and your eyes peeled, as the spectacular views are enhanced by wildlife, such as moose and caribou, frolicking freely across the vast terrain. As the train pulls into the station in Fairbanks, you will transfer on your own to your hotel for the evening. Overnight Fairbanks. The day begins as a tour bus from the Northern Alaska Tour Company picks you up from your hotel. You are off for a grand excursion in Alaska’s backcountry - the Arctic Circle Aurora Adventure. This two-day tour is based out of Coldfoot Camp in Coldfoot, Alaska and is one of the best places to experience one of the world’s greatest natural sights, the Aurora Borealis. As you make your way to the Brooks Mountain Range where Coldfoot is located, you will cross the mighty Yukon River and catch glimpses of the trans-Alaska Pipeline. During your time at Coldfoot Camp, there are numerous excursions you can embark upon during the day (not included in the price of the tour), such as dog mushing with a local dog sledder or a trip by air to Nunamiut Eskimo village of Anaktuvuk Pass. The natural beauty of the region makes it perfect for hiking or snowshoeing, as well as for photography. 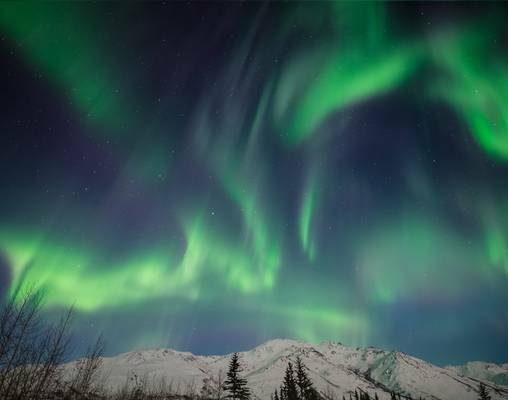 At night, the sky above the Brooks Mountains comes to life with color as the Northern Lights dance upon the darkness. Overnight Coldfoot.